Almost all the Uygurs are found in Xinjiang Uygur Autonomous Region which covers more than 1,709,400 square kilometers or approximately one sixth of China's total landmass, and is by far the biggest of the country's regions and provinces. It occupies much of the sparsely-populated Northwest. Besides the Uygur ethnic group, Han, Kazak, Hui, Mongolian, Kirgiz, Tajik, Xibe, Ozbek, Manchu, Daur, Tatar and Russian people also live in Xinjiang. 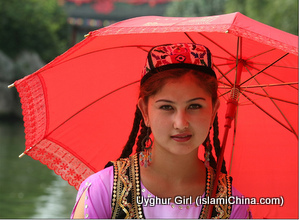 The Uygurs is the largest ethnic group in Xinjiang. They believe in Islam. Xinjiang's climate is dry and warm in the south, and cold in the north with plenty rainfall and snow. The Uygurs farm areas around the Tarim Basin and the Gobi Desert. Wheat, maize and paddy rice are the region's main grain crops, and cotton is a major cash crop. Since the 1950s, cotton has been grown in the Manas River valley north of 40 degrees latitude. The Tianshan Mountains are rich in coal and iron, the Altay in gold, and the Kunlun in jade. The region also has big deposits of non-ferrous and rare metals and oil, and rich reserves of forests and land open to reclamation. Uygur means "unity" or "alliance." The origin of the ethnic group can be traced back to the Dingling nomads in northern and northwestern China and in areas south of Lake Baikal and between the Irtish River and Lake Balkhash in the third century B.C. Some people maintain that the forefathers of the Uygurs were related to the Hans. The Dingling were later called the Tiele, Tieli, Chile or Gaoche (high wheel). The Yuanhe tribe reigned supreme among the Gaoche tribes during the fifth century A.D., and the Weihe among the Tiele during the seventh century. Several tribes rallied behind the Weihe to resist Turkic oppression. These ancient Uighur people were finally conquered by Turkic Kirghiz in the mid-ninth century. The majority of the Uighurs, who were scattered over many areas, moved to the Western Region under the Anxi Governor's Office, and areas west of Yutian. Some went to the Tufan principality in western Gansu Province. The Uighurs who settled in the Western Region lived commingled with Turkic nomads in areas north of the Tianshan Mountains and western pasturelands as well as with Hans, who had emigrated there after the Western and Eastern Han dynasties. They intermarried with people in southern Xinjiang and Tibetan, Qidan (Khitan) and Mongol tribes, and evolved into the group now known as the Uygurs. The Uygurs made rapid sociol-economic and cultural progress between the ninth and the 12th centuries. Nomadism gave way to settled farming. Commercial and trade ties with central China began to thrive better than ever before. Through markets, they exchanged horses, jade, frankincense and medicines for iron implements, tea, silk and money. With the feudal system further established, a land and animal owners' class came into being, comprising Uygur khans and Bokes (officials) at all levels. After Islam was introduced to Kashgar in the late 10th century, it gradually extended its influence to Shache (Yarkant) and Yutian, and later in the 12th century to Kuya and Yanqi, where it replaced Shamanism, Manichae, Jingism (Nestorianism, introduced to China during the Tang Dynasty), Ao'ism (Mazdaism) and Buddhism, which had been popular for hundreds of years. Western Region culture developed quickly, with Uygur, Han, Sanskrit, Cuili and Poluomi languages, calendars and painting styles being used. Two major centers of Uygur culture and literature -- Turpan in the north and Kashgar in the south -- came into being. The large number of government documents, religious books and folk stories of this period are important works for students of the Uygur history, language and culture. In the early 12th century, part of the Qidan tribe moved westward from north-east China under the command of Yeludashi. They toppled the Hala Khanate established by the Uygurs, Geluolu and other Turkic tribes in the 10th century, and founded the Hala Khanate of Qidan (Black Qidan), or Western Liao as it is now referred to by historians. The state of Gao Chang became its vassal state. After the rise of the Mongols, most of Xinjiang became the territory of the Jagatai Khanate. In the meantime, when many Hans were sent to areas either south or north of the Tianshan Mountains to open up waste land, many Uygurs moved to central China. The forefathers of the Uygurs and Huis in Changde and Taoyuan counties in Hunan Province today moved in that exodus. The Uygurs exercised important influence over politics, economy, culture and military affairs. Many were appointed officials by the Yuan court and, under the impacts of the Han culture, some became outstanding politicians, military strategists, writers, historians and translators. The Uygur areas from Hami in the east to Hotan in the south were unified into a greater feudal separatist Kaxgar Khanate after more than two centuries of separatism and feuding from the late 14th century. As the capital was moved to Yarkant, it was also known as the Yarkant Khanate. Its rulers were still the offspring of Jagatai. During the early Qing period, the Khanate was a tributary of the imperial court and had commercial ties with central China. After periods of unsteady relations with the Ming Dynasty, the links between the Uygurs and ethnic groups in central China became stronger. Gerdan, chief of Dzungaria in northern Xinjiang, toppled the Yarkant Khanate in 1678 and ruled the Uygur area. The Qing army repelled in 1757 (the 22nd year of the reign of Emperor Qian Long) the separatist rebellion by the Dzungarian nobles instigated by the Russian Tsar, and in 1759 smashed the "Batu Khanate" founded by Poluonidu and Huojishan, the Senior and Junior Khawaja, in a separatist attempt. The Qing government introduced a system of local military command offices in Xinjiang. It appointed the General in Ili as the highest Western Regional Governor of administrative and military affairs over northern and southern Xinjiang and the parts of Central Asia under Qing influence and the Kazak and Blut (Kirgiz) tribes. For local government, a system of prefectures and counties was introduced. The imperial court began to appoint and remove local officials rather than allowing them to pass on their titles to their children. This weakened to some degree the local feudal system. The court also encouraged the opening up of waste land by garrison troops and local peasants, the promotion of commerce and the reduction of taxation, which were important steps in the social development of Uygur areas. In the past, many poor Uygur farmers lived on a diet of narrow-leaved oleaster and dried apricot and peach, mulberry and grain porridge. Now, wheat flour, rice and maize are the staple foods. Uygurs in some areas like milk tea with baked maize or wheat cakes. Some are made by mixing flour with sugar, eggs, butter or meat and are delicious. Paluo (sweet rice), cooked with mutton, sheep fat, carrots, raisins, onions and rice, is an important festival food for guests.Customs and Habits. The Uygurs' cotton growing and cotton yarn spinning industry has a long history. Working people usually wear cotton cloth garments. Men sport a long gown called a qiapan, which opens on the right and has a slanted collar. It is buttonless and is bound by a long square cloth band around the waist. Women wear broad-sleeved dresses and black waist coats with buttons sewn on the front. Some now like to wear Western-style suits and skirts. The Uygurs, old and young, men and women, like to wear a small cap with four pointed corners, embroidered with black and white or colored silk threads in traditional Uygur designs. The women's favourite decorations include earrings, bracelets and necklaces. Some paint their eyebrows and fingernails on grand festive occasions. Girls in the past combed their hair into a dozen pigtails, and regarded long hair as part of female beauty. After marriage, they usually wear two pigtails with loose ends, decorated on the head with a crescent shaped comb. Some tuck up their pigtails into a bun. Over the centuries, many mosques, mazas (Uygur complexes, nobles' tombs), theological seminaries and religious courts were set up in Uygur areas. Over the past few hundred years, religion has greatly influenced economic, judicial and educational affairs and the Uygur family and matrimonial system. Some of the rich people made use of religious rules to marry more than one wife, and had the right to divorce them at any time. The marriage of the ordinary Uygurs was mostly arranged by the parents. Male chauvinism was practiced in the family, and Uygur women, humiliated and with nobody to turn to, often retreated into prayer. After 1949, feudal religious privileges were abolished, and religion was taken out of the control of the reactionary ruling class, and became a matter of individual conscience. As science and knowledge spread, many of the old feudalistic religious habits lost popularity. People can now decide for themselves whether the Sawm should be observed during Ramadan, how many naimazi (services) should be performed in a day and whether women in the street should wear veils. As these matters do not affect normal religious belief, the Uygurs are beginning to enjoy a more genuine religious freedom. The family, marriage and property are under the protection of the law, and Uygur women enjoy equality with men. Many are now working alongside men in modern industries. There are now more than a dozen million Moslems in the country, compared with eight million in the early post-1949 period. In 1953, the Chinese Islamic Association was established with Burhan Shahidi as its chairman. More than seven million people in Xinjiang believe in Islam, accounting for well over half of the national total. In the mid-1080s, there were 15,800 religious professionals, about 2,000 of whom were either deputies to the People's Congress or the Chinese People's Political Consultative Conference at various levels, or worked in the regional or county branches of the Chinese Islamic Association. The region now boasts a total of 15,500 mosques or prayer centers, or one for almost every Moslem village. Uygur culture and art, which have a long and rich tradition, has flourished. Uygur literature is very rich in style and subject matter. Many folk tales, parables, comedies, poems and proverbs praise the courage, wisdom and kindness of the ordinary people, while satirizing the greed, cruelty and foolishness of the exploiting classes. For instance, "The Tales of Afandi" contain stinging satire about the Bayis and Imams who bully the people. Much of the written Uygur literature has been passed down from the 11th century, such as the epic "Kutadolu Biliq" (Blessings and Wisdom) by Yusuf Hass Hajib, and The Turkic Dictionary by Mohamu Kashgar, which are important works for students of ancient Uygur history, culture and language. More modern works include Maulabilalibin Maulayusuf's Wars on the Chinese Land, an epic describing the 1864 struggle of the Uygurs in Ili against the Qing government. Mutalifu, the patriotic and revolutionary poet, composed poems such as "Chinese Guerrillas," "Militant Girls" and "Love and Hatred" during the Anti-Japanese War. After 19949, much work has been done to collect, compile and publish classic and folk Uygur literature. The Uygurs are excellent at dancing. 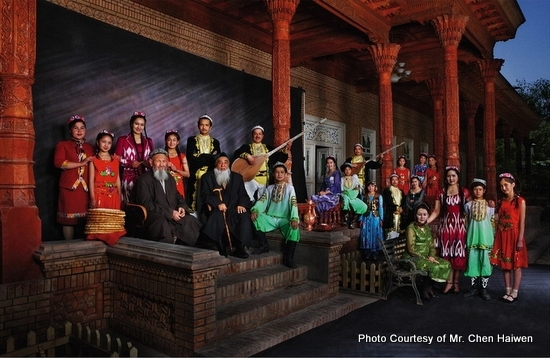 The "12 Mukams" (opera) is an epic comprising more than 340 classic songs and folk dances. After liberation, this musical treasure, which was on the verge of being lost, was collected, studied and recorded. The "Daolang Mukams," popular in Korla, Bachu (Maralwexi), Markit and Ruoqiang (Qarkilik), is another suite with distinct Uygur flavor. There is a wide variety of plucked, wind and percussion Uygur musical instruments, including the dutar, strummed rawap and dap. The first two are instruments with a clear and crisp tone for solo and orchestral performances. The dap is a sheep skin tambourine with many small iron rings attached to the rim. It is used to accompany dancing. The Uygur dances, such as the "Bowls-on-Head Dance," "Drum Dance," "Iron Ring Dance" and "Puta Dance," feature light, graceful and quick-swinging choreography movements. The "Sainaim Dance" is the most popular, while the "Duolang Dance," sometimes referred to as a flower of Uygur folk culture, brims over with vitality. It depicts the hunting activities of the ancient people of Markit. The movements portray strength, wildness and enthusiasm. The "Nazilkum," popular in Turpan, Shanshan and Hami, fully reflects the Uygurs' optimism and gift for humor.